Grab your friends and walk the Great Wall of China! Teams of 4 will push each other to complete the 13,171 miles of the Great Wall. You can walk, jog or run it. Miles will be logged weekly. The team with the most accumulated miles wins the challenge! **Winning team will receive t-shirts & drink shakers! Join us on a fun-filled, round trip to Eagle Mountain Casino in Porterville! The bus departs at 7:00 a.m. from the Community Center Parking Lot, 500 Cascade Place in Taft and will leave the Casino at 3:00 p.m. Cost is $3 per person. Ages 21+. **This event is currently full. 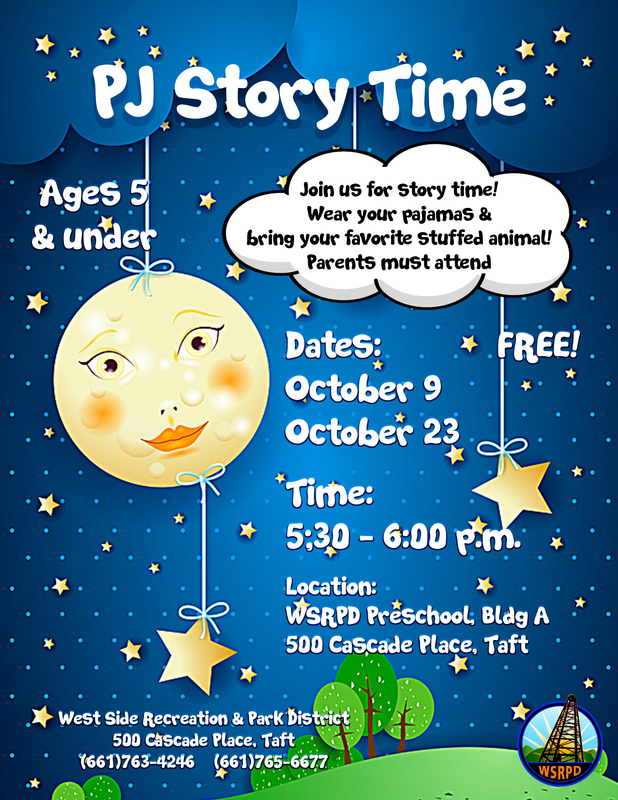 Moms and boys ages 3+ are invited to join us for a night of DJ music, dinner, dancing, photos and Amazing Race themed games. Register now in the District Office (763-4246) or the Recreation Center (765-6677). Time: 5:30 – 6:00 p.m.
Come get your blood pressure taken! Attendees will receive a card to track future blood pressure checks. Bowl as many games as you want when the lanes are open during Spring Break, We will track your scores and the top 4 games win prizes! games win prizes! Bring a basket and be sure to show up at least 15 minutes early for our Annual Easter Egg Hunt. Kids will get to collect candy, plastic eggs and prizes in two different areas divided by age. The Eater Bunny will also be there to take photos! Join is for a spread of breakfast and lunch! Come enjoy the camaraderie and delicious food. Take a break from Fortnite during Spring Break and come work on your shooting, ball handling, footwork, basketball IQ and other skills to help your game! Time: 11:30 a.m. – 1:40 p.m.
All young artists and creative minds are invited to come and leave their mark on our sidewalk. 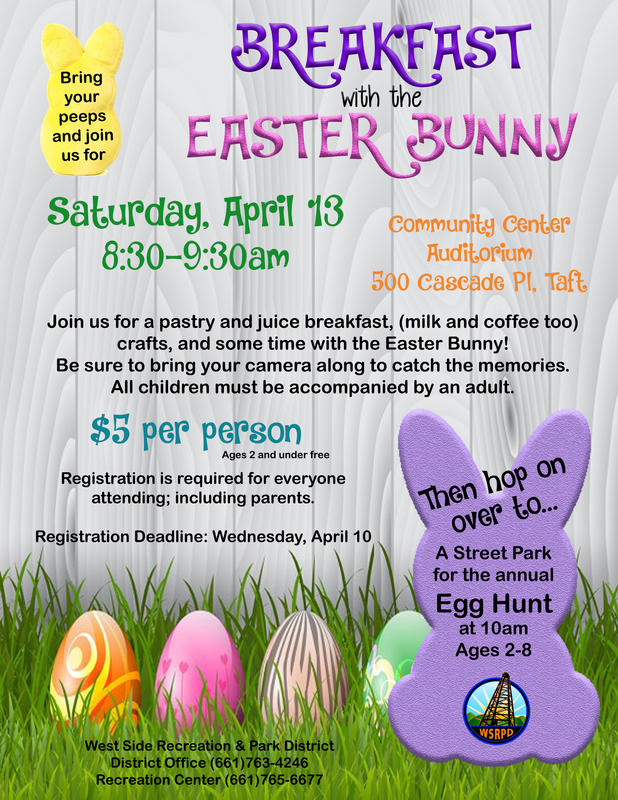 Drop-in anytime between 10:00-11:00 a.m.
Who doesn’t love a good Easter egg hunt and dessert? Join us under the awning outside the Auditorium. Join us for an hour of Bingo fun with candy prizes. Be sure to bring a friend! Hang out with us for a fun day of games, crafts, pizza lunch, snacks, bowling, sports and more. The more the merrier, so be sure to sign up with a friend! Fee includes admission to the Recreation Center and no pre-registration is required! 18apr12:00 pm2:00 pmSports, Games & More! Bring a friend and come socialize and dance for a few hours at the Community Center. Music and supervision will be provided by Recreation Center Staff. Join us the 4th Monday of the month for some cheap and easy bingo! For one low price, we will play 12 games of straight bingo’s on hard cards. All money collected will be paid out; the more money we bring in, the bigger the pots! If you have any questions call (661) 763-4246 or (661) 765-6677 or connect with us.